A little Yves Saint Laurent for All Saints Day. Yes, I coordinate my designers with the liturgical calendar. Don’t judge me, I’m pretty sure I’m the only person to play Jesus while wearing a pair of oxblood Christian Lacroix sandals with a cream crocodile sculpted heel. In your face, Jim Caviezel! Click the images for links. Sadly, the heels –could you die over those emerald soles?– don’t come in size elephant foot, but anyone who wears size 10 and below is in luck. Manolo says, it is not often the Manolo features the handbag, but sometimes the object is so striking and unusual that the Manolo cannot resist. Such is the case with the Elefante handbag from Arnoldo & Battois, the two young Italian designers. This shape is so out of the ordinary, so organically pachydermish, that it literally made the Manolo do the double take when he came across it. It is not exactly beautiful, but rather it is arresting. And, no, it is not for every taste. Such the item would most likely only work for the bohemian, downtown girl. It is too scary for the ladies who luncheon. And now, the Manolo asks, would you carry it? Last week, when the Manolo recommended the super fantastic gifts for the men, he suggested that the Amazon Kindle electronic reading machine, would be the most appropriate gift for gentleman. Subsequently, many of the Manolo’s lady friends said that this thing was something they also truly wanted to find under the tree. So, if you are the gentleman who wishes to impress the lady of your acquaintance, present her with the Kindle filled with the collected works of Ludwig Wittgenstein and Danielle Steele. This large Chloé leather bag not only has the good clean lines for the large bag, making it suitable for the classy lady of style, and yet it is also hip enough to satisfy even the most demanding downtown girl. Here is the Marc by Marc Jacobs Foret Chain Continental Clutch, the perfect little something-something to go with your lady friend’s little black dressy-dress. Everyone loves to get the cashmere, it is the fabric of love! Here is the Michael Kors Cashmere Cardigan that is simple, elegant, and somewhat reasonably priced, as such things go. The perfume from CB I Hate Perfume, the shop of Chris Brosius the most original, uncompromising, and iconoclastic of the scent designers. The Manolo is particularly fond of Memory of Kindness, described as “The shining green scent of tomato vines growing in the fresh earth of a country garden”. Chocolate! Fancy Chocolate from zChocolat delivered in the four-drawer mahogany box that will become lasting memory of the successfully delicious Christmas gift. Manolo says, this week, our friend Spirit Fingers gives us the most delightful Hermes based puzzle ever! Manolo says, the Manolo’s dear internet friends at the Bag Snob have reported the case of the public relations person who became abusive when the blogger did not do what was desired. We promptly contacted them and told them we’d return the bags and will not be able to include them in our monthly giveaway but the PR girl turned nasty and started sending us harassment emails with racist overtones. Let’s see, she accused us of using fake last names because our names are English/European yet we don’t look European (Basically non-white people are not allowed to have European surnames according to this genius PR girl) and then she accused us of trying to scam them of $150 (wholesale price) bags?!?!??! How is it a scam if we didn’t want to keep the hideous bags for our giveaway? This is outrageous behavior, and as counter-productive as anything the Manolo has ever heard of. The P.R. person who sent these emails and her firm should be named and denounced publicly. No blogger, no person, should ever have to tolerate this sort of abuse for giving his or her honest opinion about the shoddy product. In fact, once this person and her firm are named, you may be certain that the Manolo will never, ever respond to any press release or email from this firm, and he would suggest that other fashion bloggers likewise boycott them, at least until the most public and groveling sort of apology is issued. 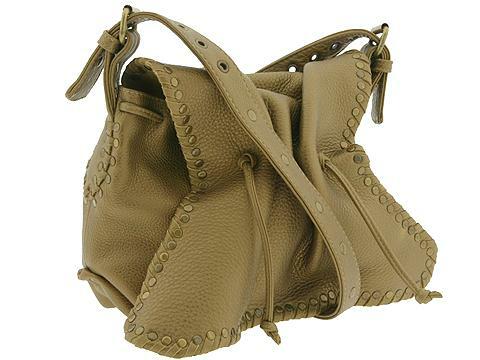 Manolo says, Ugly Purse Week continues here at the Manolo’s humble shoe blog, with this, the High Heel Shoulder Bag. Manolo: Two great tastes that do not go together. P.S. From the Manolo’s friends at the Styledash. Manolo says, while the Manolo is not in the least way opposed to the luxurious items, but sometimes they seem ridiculous. The company made the bag that special not only by price tag and design — 14 LV bags were cut up and sewn together to make it — but also by offering only five for sale in North America and 24 worldwide. The Manolo’s purse blogging friends have been talking about this for many months now, but the Manolo has heretofore restrained himself. But now this story has annoyed the Manolo, not because of the price of the purse, but because it is so terribly ugly. This is the example of how price alone, and not quality, nor beauty, is being used to define that which is luxurious. If this purse were truly beautiful, and not simply the inside-joke, hillbilly patchwork cob-job the Manolo could see paying this amount, but as it stands this is ridiculous. P.S. Ugly Purse Week Continues! The unidentified man was spotted sitting on a bench on the basement floor of a nearly vacant medical building Wednesday afternoon. Goyard bags and Tory Burch ballet shoes. Manolo says, the Manolo’s friends at the Gorgeous Things they are having the special sale for the readers of the Manolo’s humble shoe blog. Manolo says, the Manolo he has always been amused by the Lulu Guiness and her witty way with the purses. 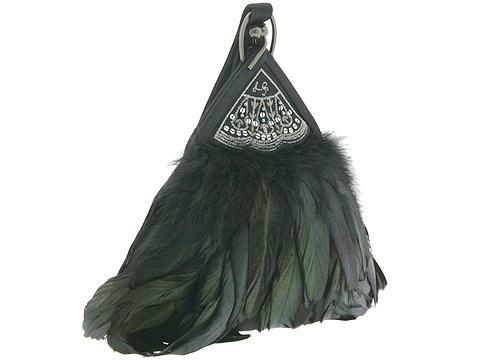 This one with the feathers and the fan shape, it is dressy but not stodgy, rather it is whimsical, and yet would be most suitable for toting to the fancy party, preferably with the well-dressed man on the other arm. Manolo says, the Manolo he has decided to do the purse blogging for the Christmas, so that perhaps his gentlemen readers will have some idea of what the womens in their lives may appreciate. Trust the Manolo, nothing says “Merry Christmas, Honey, Your Husband He is Not the Clueless Lout!” like the appearance of the designer bag under the festive tree. The Manolo, he absolutely adores this suede shoulder bag with the shearling trim from the Hogan. It is very, very rico suave, so muy rico suave that the Manolo he feels he could crawl inside and take up the residence in it’s capacious, yet cozy confines. This it is the winter bag that will be brought out each year at the first hint of the tiniest nip in the air, so eager will she be to carry it. The hobo bags they are raging this season, and so the Manolo he has tried to pick out the prettiest of the the hobo bags for your consideration. 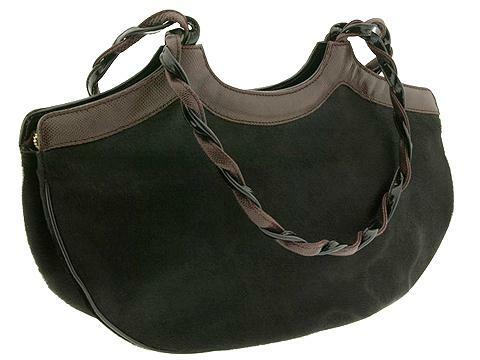 This one it is the velvet hobo bag from the Marc Jacobs. Is it not both very soft and very feminine? It would be the right bag to accompany many of the flowing, womanly styles of this season. Here is another of this season’s unstructured shoulder bags in the suede, this one from the Pollini. For the Manolo it is the details of the contrasting leather on the straps for the shoulder that make this stand out from the crowd. Here is another of the soft, unstructured bags that the Manolo is so fond of for this season. This one it is from the Carlos Falchi. The leather it is wonderfully supple, and the details they do not overwhelm the basic good looks of this bag. Manolo says, this it is the famous Duct Tape Bag from the Vanessa Jean. The material and the colors they make the Manolo smile with their funky wit. Yes, it is certainly not for everyone, however, if you are the young hip girl of the downtown, it is perhaps right for you. And best of the all, it is the inexpensive treat, selling for under $70 of the American dollars at the LoveMyBag.com!